Royale coupon is a mailed coupon available at GoCoupons.ca. Visit GoCoupons, create your own account, select the Royale napkins coupon and claim your coupon. Once you claim it, GoCoupons should send it out and you will receive it in about 5-8 days. All coupons are free and delivered for free. 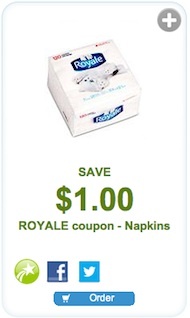 This is a Royale Coupon to Save $1 on Royale Napkins. The premium dinner napkin, trusted by generations of Canadians for its reknown quality and plush feel. Royale dinner napkins are distinctly embossed to deliver an elegant dining occasion. 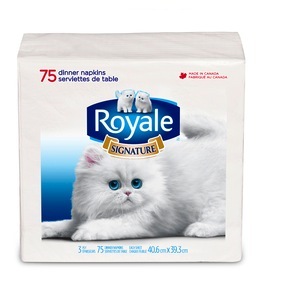 All Royale napkins are “Made in Canada” by Irving Tissue, a family owned business dedicated to responsible forest management practices.